Rehlat offers the convenience of booking Istanbul flights in a simple user-friendly interface. Enjoy huge savings on all Istanbul flights. Simply enter Istanbul as destination and the airfare list of Rehlat will show you major, popular, and budget airlines at one place. Compare and book as per your convenience and visit the historical modern city of Istanbul. Most of the domestic and international Istanbul flights land at Ataturk Airport or Istanbul Ataturk Airport, which is well connected to the city. Being one of the most visited cities in the Turkey, Istanbul invites more than 12 million international visitors every year. It is recognized as the most popular destination for a perfect city break. 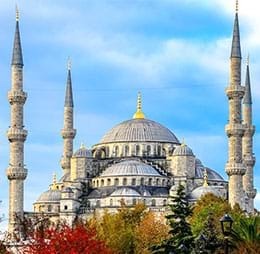 Istanbul is home for numerous tourist attractions including Hagia Sophia, Topkapı Palace, Basilica Cistern, Galata Tower, and Dolmabahce Palace. Istanbul is known for its world class shopping malls, luxury boutiques, large department stores, street stalls and old markets. It has some of the best iconic landmarks for shopping lovers like Bayrampaşa, Sarıyer, Beşiktaş, Başakşehir and Sultanahmet-Fatih. Never miss to buy local made products including pure handmade herbal soaps, traditionally embroidered fabrics, antique jewellery, and Turkish coffee powder. Turkish food is one of the finest and most varied cuisines in the world that offers a rich combination of flavors and ingredients. Istanbul is filled with several popular restaurants within the city including Old Ottoman Cafe & Restaurant, Harem Istanbul Cafe & Restaurant, Çiya Sofrası, Erhan Restaurant, and Marbella cafe restaurant. Istanbul has a vibrant and dazzling nightlife with nightclubs, pubs, dancing spots, rooftop bars, and much more. There are lots of places in Istanbul, where you can enjoy best nightlife like Pub Crawl Istanbul, Suada Club Galatasaray İsland, The Happy Hole Bar and Nardis Jazz Club. Istanbul boasts one of the largest public transportation networks in Turkey. There are different modes including city buses, ferryboats, metro, taxis, tram and train. Istanbul Atatürk Airport is the largest airport in Turkey that serves more than 273 domestic and international destinations across the world. It is the main hub to AtlasGlobal, Onur Air and Turkish Airlines. Istanbul Atatürk Airport is recognized as the 10th busiest airport in the world in terms of international arrivals. Terminal 1 is used for all domestic arrivals and departures within Turkey. This terminal is well equipped with own check-in and airside facilities, as well as five baggage reclaim belts. Terminal 2 serves for international arrivals and departures. It is filled with excellent facilities including cafe shops, restaurants, airport lounges, bars and many more. Istanbul offers easy and reliable to travel to and from the airport by taxi, airport bus, tram and metro or Airport Transfer Services. The metro will travel from Ataturk International Airport to Istanbul city every 15-20 minutes from approximately 06:00 till 23:00 hours. Istanbul boasts of several budget hotels and has many state-of-the-art 5-star luxury hotels that offer an engaging environment and exceptional culinary experiences to their guests. Apart from a host of contemporary amenities like fitness centers, Wi-Fi, bed and breakfast benefits, most of the Istanbul Hotels have world-class hospitality combined with scenic outside views to delight the guests.